I have been trying to focus my sewing efforts on completing my (numerous) UFOs. On the surface, that is certainly a laudable effort, but in reality, I'm an idiot (not a complete one, though, as some parts are missing). I had really, *really* decided to work on my *existing* UFOs so that I wouldn't have such massive Guilt Attacks when I signed up for not one, but TWO online quilting courses! Now if that isn't a sheer act of lunacy, I don't know what is. My goal (other than completing the class) was to use *only* stash fabric ... an endeavour I've been concentrating on lately. In addition, I decided that this wouldn't be a "serious" quilt in that I was making it just for the experience of the class and to play around with techniques & fabrics. 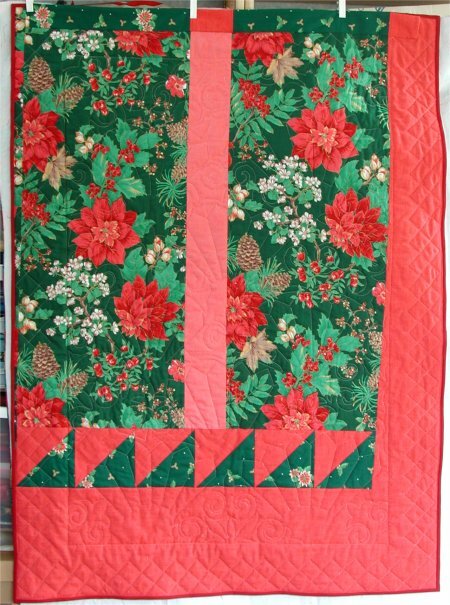 This quilt is a Christmas Stack-n-Whack Fan, but not entirely successful. 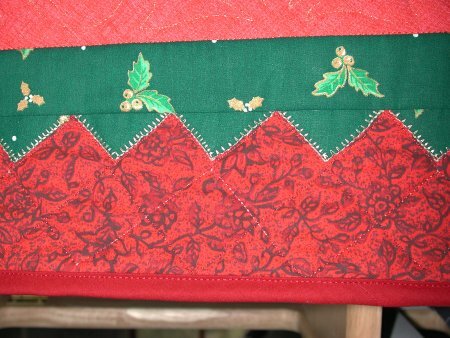 The Christmas fabric I chose from my stash was a remnant from some other project (a long-past Christmas/birthday dress for my middle daughter) and so I was constrained by the physical dimensions of the fabric. This turned out to be quite a challenge because for Stack-n-Whacks, you are essentially fussy-cutting everything. As a result, the fans I was able to make weren't all the same length since the available fabric for that particular design varied. However, remembering that this was an experimental quilt, I'm not bothered at all by this discrepancy. I used Bethany's technique of machine appliquing the fans onto a background square. I used a gold metallic thread and my machines Point d' Paris stitch (a fine gauge blanket stitch). What was weird is that the stitch turned out perfectly for the fans themselves .. then I took a break from sewing due to Real Life .. and when I returned to the project to work on the simulated prairie points on the border, the Point d' Paris stitch went somewhat screwy on me! This was mildly annoying. On the advice of my long-arm machine quilter, I also tried a basting adhesive spray instead of hand-basting, as I usually do. This was the *fastest* way I've ever assembled a quilt sandwich! However, (this is where the shoe drops), eventhough I followed her suggestions to only *mist* the spray on the quilt, I discovered that gluey goo kept accumulating on my needle, causing skipped stitches. This was REALLY annoying because by this time I was doing the free-motion quilting in metallic thread. I'd be going along fine and dandy when suddenly ... *boing* ... massive skipped stitches. I used rubbing alcohol to clean off the needle before re-stitching the area. As a result, the majority of the machine quilting isn't terrific. 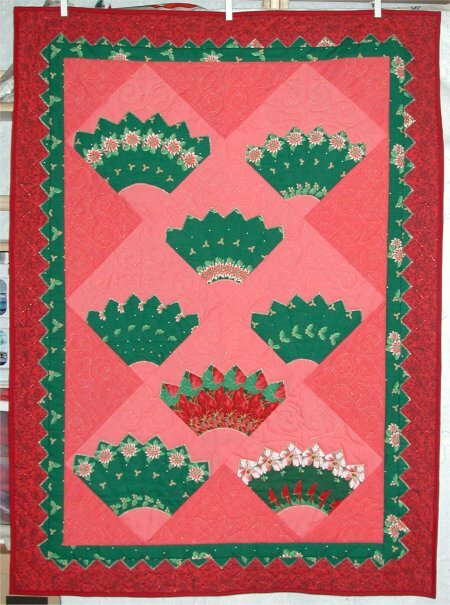 I quilted a fleur-de-lis at the top of every fan. 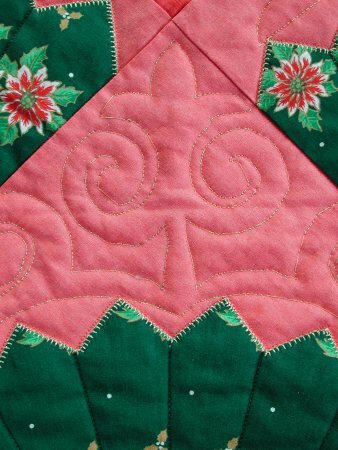 You can also see the Point d' Paris stitch that attaches the fan edges to the background fabric. Here's a picture of the border - you can see that I reversed the Point d' Paris stitch. I'm not sure why I did that, perhaps just for variation. An interesting side light is that I was able to successfully sew on the quilt (through the basting adhesive) with the metallic thread if I was doing standard straight stitching .. it was only when I did the free-motion stuff that the skipped stitches appeared. The quilt is 37"x51" .... too small for a useable quilt but a nice enough size for a wall-hanging. It was during the following summer (2002) that Mr. Pirate and I went on one of our "adventures". This adventure was to the Black Rock desert of Nevada, where we had heard (from a previous adventure) of a dig-it-yourself opal mine. We researched this and found out where it was and so, in the summer of 2002, we journeyed to the grand burg of Gerlach, Nevada, which we used as our base camp. During one day's excursions, we actually found the opal mine, but as we had started waaaaay too late in the morning, the heat was much to intense for us to go digging. Instead, we spent a very nice time chatting with the Opal Mine Lady. She was gracious enough to give me a small opalized rock, perhaps as consolation for our lack of planning (and not being able to dig for any opals ourselves). It just so happened that I had expressly brought up the Stack-n-Whack Fan quilt to give to her, as a thank-you, whether or not we actually found any opals, so it was a good trade for both of us.